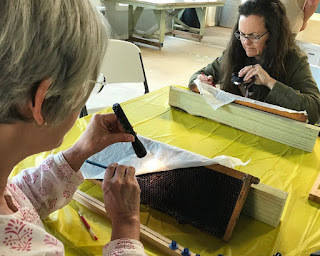 Twenty-four beekeepers attended my queen rearing class at Bemis Honey Bee Farm as part of our continuing beekeeping educational program. The beekeepers expanded their understanding of honey bee biology and bee colony reproduction. They learned the conditions under which bee colonies produce queens, including preparation for swarming. Before a bee colony divides itself and swarms, it produces a new queen to continue reproducing bees in the original hive. The hive conditions that lead to swarming are the same as beekeepers create to encourage bees to produce queens. The beekeepers learned the importance of record keeping and colony evaluation in producing high quality queens. By carefully observing a bee hive’s characteristics, beekeepers evaluate the queen’s traits. They then select hives with desirable traits to become “drone mother hives” which produce high-quality drones to mate with virgin queens. Hives that the beekeeper determines to be the best-of-the-best are designated as “queen mother hives” producing larvae to develop into high-quality queen bees. The beekeepers learned that to produce these high-quality queens three conditions are necessary: First, we must select from parent queens with good genetic traits; next, the queens must have good nutrition throughout their development; and finally, the virgin queen must successfully mate with a large number of high-quality drones. The beekeepers learned the actions to take to develop a queen-rearing program for continuous stock improvement.